I’ve been meaning to write about THE LONELY PASSION OF JUDITH HEARNE for the longest time, but it’s not the easiest film to write about without falling into hyperbole. The last theatrical feature of the gifted and dizzyingly versatile Jack Clayton, it simply has to be experienced, and it all too rarely is. 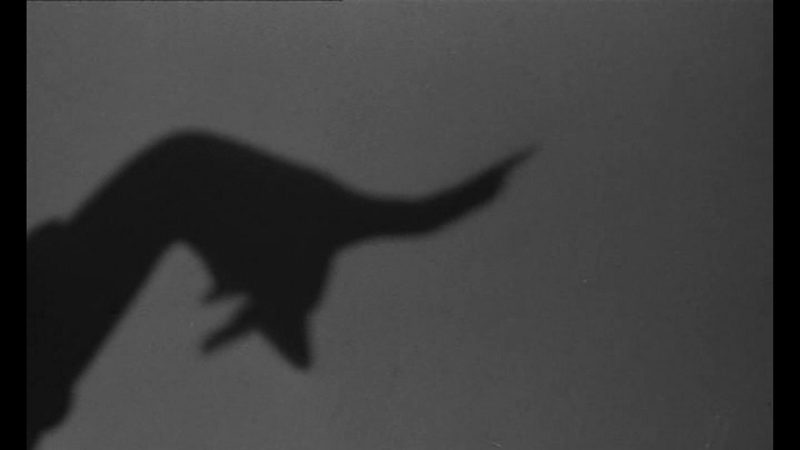 Which is why it seems perfect for The Forgotten, while also tying into our ongoing December blogathon. Interested parties can explore further by clicking the links below. Two French spy flicks — MATA HARI, AGENT H21 with Jeanne Moreau (!) and LE MONOCLE NOIR. 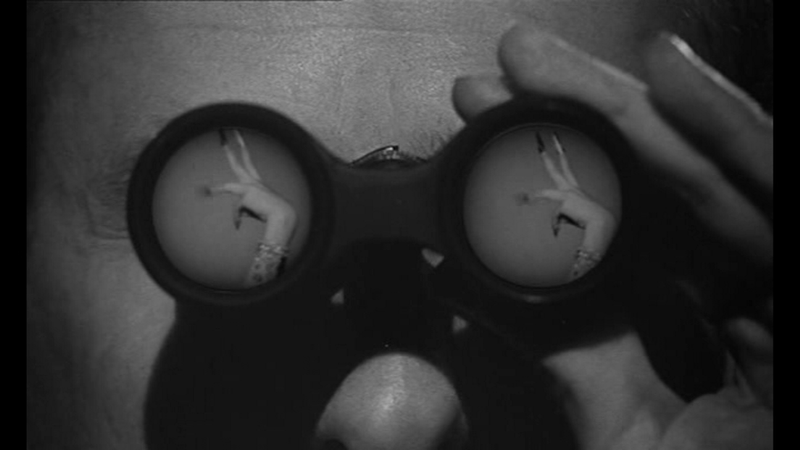 My model for this kind of thing is Clouzot’s LES ESPIONS, an existential/absurd nightmare of surveillance and menace, in which the entire population of the film is gradually replaced by secret agents. It’s like Ionesco or something. Doesn’t entirely work (abandoning the tight spatial constraints of the first two-thirds for a muddled climax feels like a desperate mistake), and its box office failure nearly killed Clouzot’s career, but it’s my starting point for thinking about French spies. This would seem grotesque to a French film buff, since the genre’s been such a popular and productive one across the channel. More intriguingly, the WWI romp (and the incongruence of that descriptor should clue you in to the kind of dissonance to expect) was co-produced and co-written by Francois Truffaut, who I guess had to eat. Truffaut is credited with dialogue, which I’m in no real position to judge, since he made the technical error of writing it in French, but his connection to the film also resulted in an eccentric cameo by Jean-Pierre Leaud, utterly pointless except for its sheer point-and-laugh entertainment value (think Belmondo in CASINO ROYALE) and a score by Georges Delerue. Ah, Delerue! My Sansa Media Player (highly recommended) is stuffed with his film scores. He enhances the beauty and resonance of any film, even one as already heartbreaking as THE LONELY PASSION OF JUDITH HEARNE. Given a piece of dumb froth, he injects it with emotion… strikingly, while a film will be unbearable if it attempts to latch onto unearned emotion by hitching itself to some major issue or real-life tragedy (most commonly, the Holocaust), it can only benefit from a score that’s too beautiful. The movie really doesn’t merit such a lovely soundtrack, but it doesn’t cause any problems. Beautiful music, like beautiful photography, is never destructive as long as it’s used with taste. 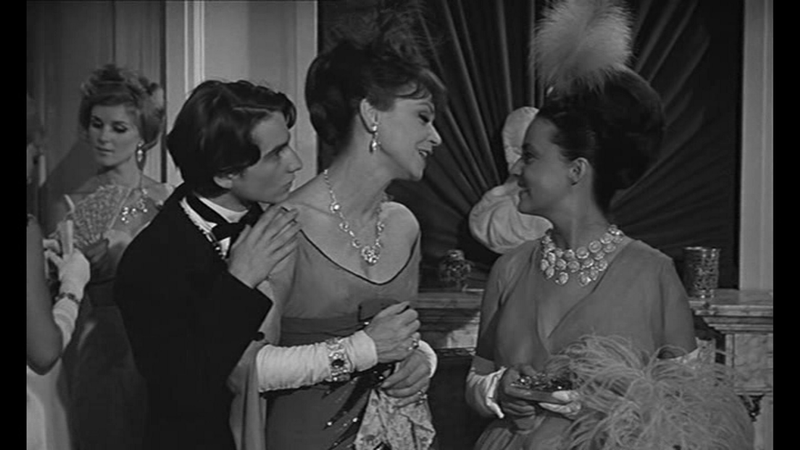 This sequence tells us several things: (1) The movie is cheerfully dumb and ahistorical (2) It’s inventive and cute (3) Jeanne Moreau will be showing her breasts. All of which are central to Richard’s purpose. In fact, they are Richard’s purpose. Later, in a suspenseful bit, Moreau distracts Jean-Louis Trintignant while his valise is rifled, then falls in love with him. The WWI romantic stuff, complete with stock footage, recalls JULES ET JIM, arguably a mistake (Rule #1 is never remind the audience of a great film while making them watch a silly one). Silly as it is, the movie is entertaining and occasionally exciting. The last third suffers from the unavoidable predictability: once we can see how Mata’s going to get caught, it’s a drag waiting for it to happen, and the final execution arrives none too soon. Bang! 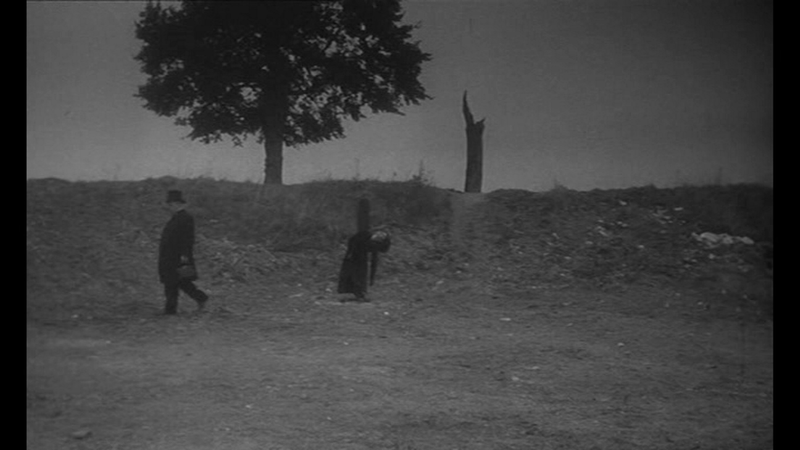 The abruption, simplicity and brutality of the slaughter is shocking and effective, the camera lingering a moment on the slumped corpse… and then Richard proves himself a true hack by dissolving to a slomo shot of Moreau et Trintignant romping in a field of long grass. He falls at the last hurdle, failing not only as a filmmaker but as a critic and audience of his own work — anybody can see that the ending was more striking and powerful without that bit of faux-impressionist cheese. LE MONOCLE NOIR is from Georges Lautner, whose LA PASHA I semi-liked. This is maybe better: it has a definite style, that early sixties b&w expressionist noir look most commonly found in the German krimi. It avoids the flashy attempts to be with-it that seemed so jarring in PASHA. 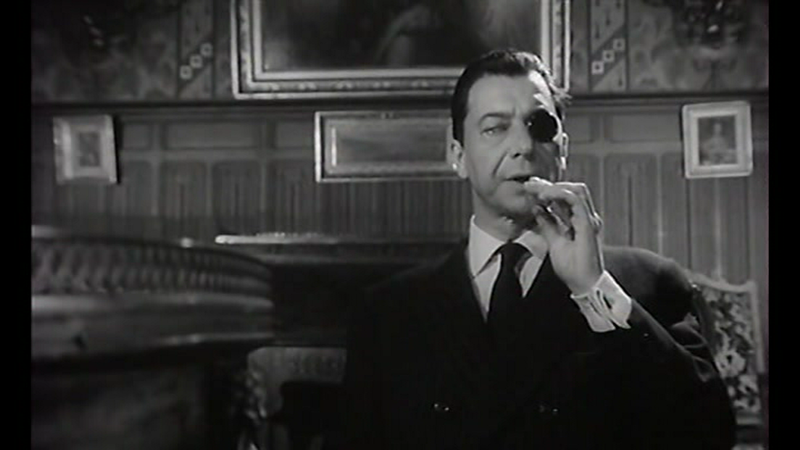 And indeed, LMN was so successful it spawned two sequels, both starring Paul Meurisse as the titular spy, known by his black monocle. A disparate group of fascist conspirators are gathered in a chateau to await the arrival of a Martin Bormann type, a high-ranking Nazi escapee who’s supposedly going to lead their movement. But, in an echo of Clouzot’s headspinner, most of the cast are actually double agents, working for Russia, Germany and France. Meurisse has recognized his East German counterpart (Elga Andersen, voluptuous and saucy) and she has recognized him, but the Russian is unknown to both of them. This being a French movie with Nazi villains, the commie spies aren’t actually baddies, just additional counters on the board. 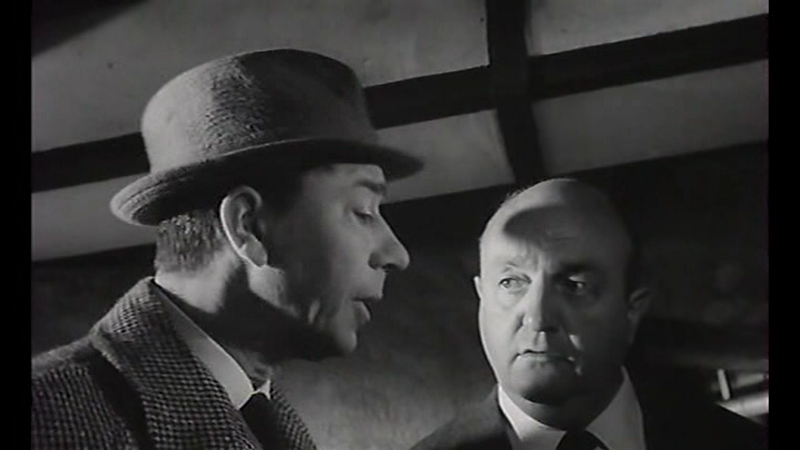 Rolly-polly drolerie from Bernard Blier (right). 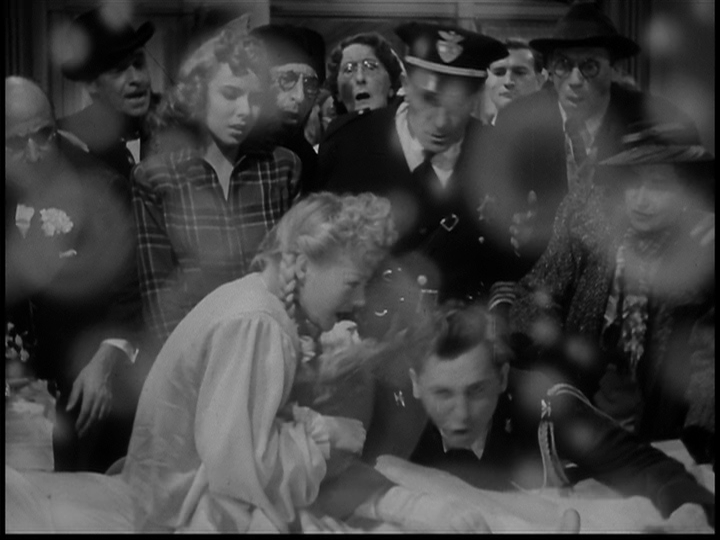 The film has a certain sly drolerie, augmented by the presence of Bernard Blier as a small-town police chief: he also introduces the film, saying “Tonight, the secret agents will have no secrets from us. See you soon.” The charm is slightly marred by off-color jokes (Andersen: “Ever since the fall of Berlin, if I make love out of doors, I feel like I’m being raped.” A line even Tarantino might balk at) and tonal uncertainty — a genuinely gripping chase ends with a sympathetic character murdered, and the heroes expressing no emotional reaction. 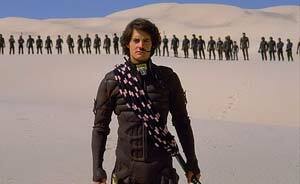 The movie could play its games much better if there were no innocent civilians in it at all. Actually, that might be true in real life too, of all espionage, and all wars.